THE REVIEW: The wait for a new Star Wars film is finally over. In its opening weekend, it broke countless box office records as expected as well as expanding the franchise to a new era and a new generation of fans. I’ve already seen it twice in three days and am planning on seeing it at least another two times before it leaves theaters. Most of this review will be talking about The Force Awakens in terms of the mystery which shrouded the film all the way until release and how going in dark really made this film an experience I will not soon forget. This being said, and wanting as many people as possible to see this film for the first time spoiler-free, I will refrain from talking about any details whatsoever besides perhaps new major character names — Rey (Daisy Ridley) and Finn (John Boyega). Even on my second viewing, I was struck most by how The Force Awakens is able to capture my attention and imagination. Perhaps the biggest reason the original trilogy — the good/only trilogy — was and is still so successful is because of this fact. 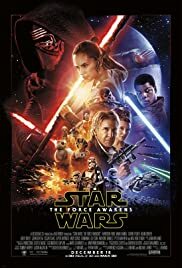 Since its release in 1977 Star Wars has spawned multiple films, television shows, and novels (of which post-Return of the Jedi stories are now not part of the official canon) and has a rabid fanbase and did so from an original story which has sooo much more going on beneath the surface than what is shown. Star Wars (I’ll reluctantly call it A New Hope to make things clearer) is terrific as a standalone film. Beginning, middle, and end all included, not much filler, and no real loose ends. And yet, it raises countless questions like how did the Empire gain control over the galaxy, what are the Jedi and Sith powers, the origins of Luke Skywalker and the Alliance, and more. Questions we found answers to in future films but yet still left ample room to delve into further (hello expanded universe. A New Hope is my favorite of the franchise (sorry Empire Strikes Back fans) partially because it strikes this amazing balance between a standalone story and mystery/unanswered questions. For those that have seen The Force Awakens it should be no surprise why I find the movie so appealing. It achieves, for the most part, that awe and wonder which A New Hope did almost four decades ago. This movie feels like a Star Wars movie down to the sets, the characters (both humanoid and not), action, and humor. It charts its own path while still recognizing what came before and establishes a wealth of opportunities and possibilities for future expansion. THE TAKEAWAY: As much as I enjoy The Force Awakens, I won’t go so far as to say it’s my new favorite (yet, at least), in large part due to the fact that it still has that new car smell to it. Naming it my favorite would just be jumping aboard the hype train and doing so before having time to really process and reflect on how The Force Awakens fits into the bigger picture of the franchise. A New Hope still sits atop my favorites list, partially for this reason — the legacy and memories of such iconic scenes and shots (like the binary sunset and the attack run on the Death Star). The Force Awakens may be bigger and bolder, especially in terms of size, but to me I think a scene like the Death Star attack will always be more entertaining to watch than the attack run on Starkiller Base. What’s most interesting to me however is the future of Star Wars and the sequels yet to come. The Force Awakens sets the baseline for this new trilogy and sets it pretty high, yet not insurmountable. Seeing how the First Order’s influence in the galaxy spreads, the Resistance fights for good, and where the Jedi/Sith go from here are all incredibly rich areas for development not to mention the complex characters of Rey, Finn, and the adorable BB-8. The force has most certainly awakened, and the creative people at Disney are taking it in a direction which I’m eagerly awaiting to see how things play out.